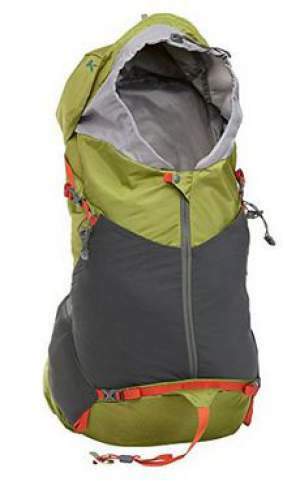 Kelty Siro 50 pack – front view. Kelty Siro 50 backpack for men has appeared in the beginning of 2017 as a completely new model with several unique features. This is an ultra lightweight hiking pack with only 1.4 kg of weight and 50 liters of volume. Unique combination of the top and front access points. Unique dual front stretch pocket. Great ventilation due to new FeatherFIT suspension. 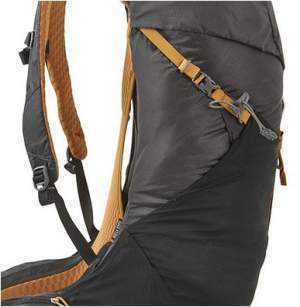 There are many Kelty’s packs presented in this site, and they all have at least something unique. This tradition has continued with the Siro 50 pack, so let me say a few words about these unique features first. As you realize from the images, it looks like a top-loading pack because it has the traditional lid. But the collar underneath the lid is all but traditional, and it is partly on the front of the pack, it looks more like an opening on a jacket than the collar on a pack. This impression becomes even stronger when you see the long front zipper which goes completely to the top opening. You even have a snap button on the top-end of the zipper. So the collar and the front zippered opening are connected completely, and the pack opens all the way to the bottom, allowing you an easy access to everything inside. This design they appropriately call Shark’s mouth access. The lid attaches to the front of the pack through a single strap instead of the usual two, see the picture. The top opening and the front zipper. The internal space is one single big compartment without any extra organization. This is fine because the pack has a separate external hydration sleeve, so this feature is very similar to what you have in Kelty’s new Revol and Reva series. It is good to have such a separate space which allows for an easy access to the water bladder, but I am always puzzled with how to use this space best way if you do not use a water reservoir. First, observe that the harness is not adjustable in this model. 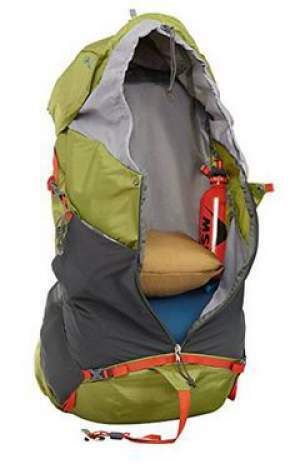 But the suspension in this back is something new for Kelty. To the best of my knowledge, this is the first Kelty’s pack with the suspended back panel, which is tensioned by a peripheral steel frame. The suspended mesh design is nothing new in general. It is used by many brands, the system was introduced by Deuter decades ago and used in many of their packs. 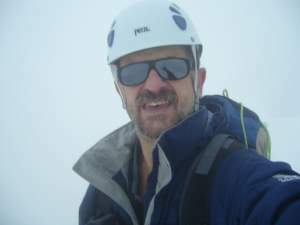 Several top brands use it in some of their packs as well, like in Osprey Exos 48 and in several other packs of this brands, and in Gregory’s packs like Zulu 40. Though the whole back structure here reminds me a bit of the Osprey’s anti-gravity design. This impression I have because of the almost seamless construction that covers all the back side, the hip belt, and the shoulder straps. 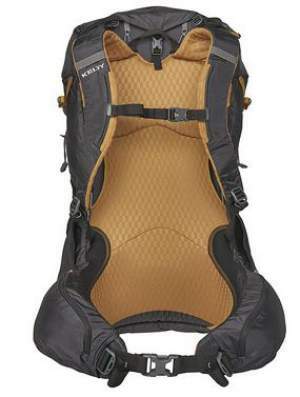 It is also very similar to the new redesigned Sirrus 50 pack by Osprey. But in the case of the Siro 50, this back material is quite different, it is not so transparent mesh like in the other mentioned packs. The tensioned panel separated from the pack. Now, what makes this important? I have been using such packs with suspended mesh by Deuter for several decades now, and I am pretty sure that this is the best system regarding the ventilation. The air can escape in almost all directions, the back panel is completely separated from the pack, as you can see in the side view above. So this is what they call the FeatherFIT suspension, similar to existing designs in other brands, but there are differences as well. There are two front stretch pockets, something unique again. They are separated by the mentioned vertical front zipper and they provide quite some space for your extra layers and gear. One zippered pocket is on the lid, two stretch water bottle pockets are on the sides, angled for an easy access to the bottle, and two zippered pockets are on the hip belt. You also have dual upper side straps and one horizontal bottom strap, they allow you to cinch the pack and to stabilize the load. Dual attachment loops on the bottom are paired with bungee tie-offs which you can see in the images; this is for ice axe and trekking pole attachment. The harness is not adjustable, but there are two torso size ranges to choose in the moment of purchase, so this should be good enough. Weight: 3 lb 1.5 oz (1.4 kg). Volume: 3100 cub in (50 L). Carry weight: up to 30 lb (14 kg). – S/M: 16.5 – 18.5 in (42 – 47 cm). – M/L: 18.5 – 20.5 in (47 – 52 cm). Size: 27 x 13 x 10 in (69 x 33 x 25 cm). – Frame: steel + HDPE. – Body fabric: Nylon 66 330D Mini Rip PU. Shark’s mouth top loading access. Center front zip panel access. Dual entry large stretch mesh front shove-it pockets. Front, lower, and side compression. Dual trekking pole/ice axe attachments. Hex Mesh back panel, shoulder straps and hip belt. As you realize, the Siro 50 pack is much lighter than the other two, but this is on the account of some missing features. To conclude, the Kelty Siro 50 backpack for men comes with an original design and with a very lightweight construction. So this is a great option for ounce-counting outdoor adventurers who want a minimalist design but still need a very comfortable, advanced, and nicely ventilated suspension system. This is a great pack for travelers as well. The Siro 50 may not be full of features, but when you see its back side, you realize its suspension system is truly great. If you need a similar pack for women, this completely new series includes Sira 45, with a women-specific harness design, and with the same features. At this moment, I am not aware of any other pack size in this Siro-Sira series. The price of the Siro 50 at the moment of writing the text is $200, for updates please follow the link given below. 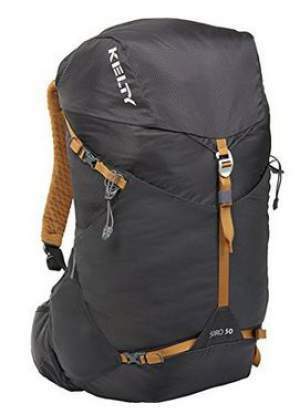 If you feel this the Siro 50 pack is not what you want, and you need something different of the same size and from the same brand, please see this Kelty Revol 50 pack, which is also a completely new model for men, appeared on the marker in the beginning of 2017. 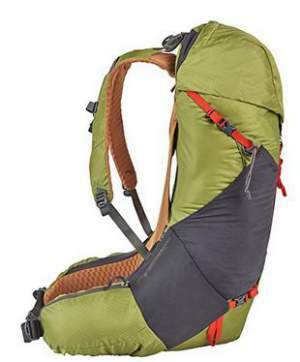 Check also this new Kelty Redwing 50 Tactical pack. Note also that they have launched a new Zyp series in 2019, so compare this pack with their Zyp 48. Thank you for reading. It would be great to hear your opinion about this new Kelty’s series. There is a comment box below. I wish you a nice day.